Our aim at Off The Charts Games is to continually bring you new products. 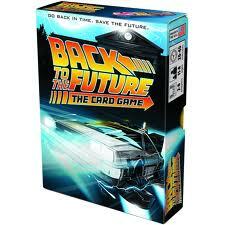 Just arrived this week is Back to the Future The Card Game. "In this game you are a time traveler, a descendant of one of the characters in the Back to the Future movies. Unfortunately, other time travelers have been tampering with events in your past, endangering your very existence. You must put things back in the ways that seem right to you, then stop Doc Brown from ever inventing time travel, which will freeze reality the way tyou need it to be, once and for all. The game is played entirely with cards, but has the feel of a board game since important events are represented by a special grid of 24 cards called the TimeLine." Another great game from Looney Labs, the makers of Fluxx and Seven Dragons. Please come in and visit us at Off The Charts Games and see our new games that came in this week.